Based on the world’s famous SkyVac system, we have now developed the only independently certified ATEX high level cleaning system compatible with all ATEX vacuums. An extremely powerful system suitable for Class M combustible dusts within ATEX Zone 22 hazardous areas. A powerful yet lightweight system suitable for Class M combustible dusts within ATEX Zone 22 hazardous areas. ATEX certified carbon fibre poles 1.5 metres long. Antistatic pole and accessory carrying holdall. All our ATEX rated anti-static end tools are all manufactured from conductive material. 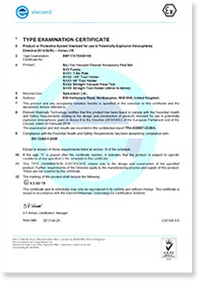 Click to view the ATEX examination certificate and the ATEX safety document. If this vacuum cleaner is used for collecting flammable/explosive materials or within a zoned area classified under the ATEX 137 Directive 1999/92/EC then a risk assessment must be carried out by a competent person to verify the suitability of the application. The ATEX certification code for the appliance being assessed. (See the rating plate on the machine). High-power vacuum cleaners ATEX-certified high-power vacuum cleaners offer important safety standards with truly incredible vacuum power. Our SkyVac ATEX pole kits have been certified as a complete assembly for safe use within ATEX 22 explosive dust zones. We understand this is an internationally unique solution. Tested and approved by www.element.com - certificate number EMT17ATEX0019X.